The results are in. Last month, we asked you to write the most effective copy for a Consumer Reports email in a way that could also test which value factors were most appealing to Consumer Reports donors. We’ll get to the results, and the big winner of the MarketingSherpa Summit package, in just a moment. But first, a few lessons for you and a little more background. 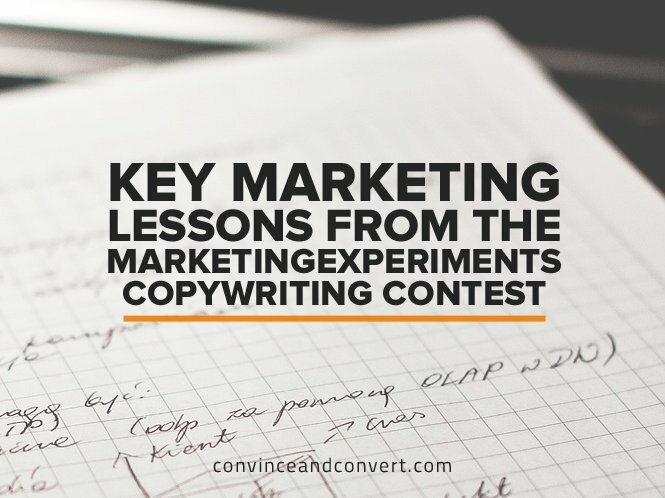 Every year, we run a test like this with the MarketingExperiments blog audience and the audience of another marketing blog—in this case, Convince & Convert. We find marketers at a nonprofit for two reasons: we want a real audience to test with, and we want to use our collective ability as a community of marketers to create effective messaging for a greater good. We work with the nonprofit for a few months, diving into the data, getting an understanding of previous tests, and coming up with hypotheses. Then we go out to you, tell you what we’ve learned about the nonprofit, and give you a chance to win a package for MarketingSherpa Summit (produced by MarketingExperiments sister publishing brand). This year, the prize was a ticket to MarketingSherpa Summit 2016 and a stay at the Bellagio. We award the prize based not on what we imagine will be most effective, but rather on the actual results with real customers. We then use what we learn from this test to run a followup test, crafted by the MarketingSherpa Summit audience. This “live test” is launched and results are reported during Summit. The goal of this public experiment is to create a tangible example of customer-first marketing to help you improve your own marketing efforts while putting the customer first. Problem Statement: The generic value communicated in the renew emails does not match the motivation of why a past donor would want to contribute to Consumer Reports. Hypothesis: By highlighting specific value claims that communicate the appeal and exclusivity of donating to Consumer Reports, we will increase the overall clarity of value of donating while better matching customer motivations, leading to higher clickthrough to the donation landing page. Primary Research Question: Which value claim best matches past donors’ motivation to donate again? “Testing four panels [treatments] plus a control is something we haven’t done, as we tend to do one to two test panels at a time. Investing in a test like this, where we took the time to come up with four different themes and testing them head-to-head in one test, is very valuable to have and has inspired me to challenge ourselves to consider doing more robust testing in one round, rather than straight A/B testing in multiple rounds, to get learnings sooner,” said Dawn Nelson, Director, Fundraising, Consumer Reports. The control outperformed all of the treatments. The control had the largest impact when measured against treatment 4 (29.2% relative decrease at 99% level of confidence), while it did not validate when compared to treatment 3 (6.7% relative decrease at 85% LoC). There are two levels of lessons you can gain from this experiment. At the base level, there is the analysis you must conduct with any test: why did one treatment perform better than the other? Or in this case, why did the control win? “This testing reaffirmed that our core donor still responds best to messages around product testing, and that is their main connection with Consumer Reports. Asking for a donation around this theme still works better than messaging around empowerment or our impact work in particular (to the broad audience),” Dawn said. “The big takeaway for me on our customer (and something we have suspected and need to test further) is we definitely can talk in a broad sense to our donors and see good results. But if we can do segmentation and talk to those segments in very specific language, we may see better conversions,” said Bruce Duesterhoeft, Program Manager, Online Fundraising, Consumer Reports. The value proposition for the control focused on multiple value statements throughout the email, which could have appealed to the motivations of a wider user base over the treatments which focused exclusively around one value statement. The control and treatment 3 focused on the quality of research, increased clarity about Consumer Reports testing by using specificity surrounding the testing process, and how Consumer Reports would use donations. The other treatments did not provide specific value points which could have hurt the clarity of the value proposition. The value proposition of treatment 4 (consumer empowerment) did not provide as many specific evidentials to support the claim of consumer empowerment which reduced the clarity and appeal of the email, causing it to perform the worst of all treatments. The opening statement of the control may have provided more relevance to customers and provided continuity from previous customer touchpoints. Across the control and all treatments, the most clicked links were the red “Donate” button CTAs on the top and bottom of the page. However, the next most clicked link was the membership benefits link in the footer of the email. This shows that length-based friction may not be a deterrent for this group base and that many are motivated to learn about benefits membership provides. Those motivated by the value of the testing and personal/impact are the most likely to donate more money; however, there are less Consumer Reports donors motivated by altruistic outcomes than there are by the product testing process. Both the control and treatment 3 used very similar layouts that mix bullet points, paragraphs, and text links. This layout reduced difficulty-based friction associated with longer emails, providing clarity for customers trying to absorb the information being presented and understand the overall ask of the email. The previous lessons apply specifically to this test, but there is a bigger lesson to be gained from this public experiment. But they didn’t settle. When approached with a very out-of-the-box idea, they jumped in wholeheartedly—and I can attest, throughout this process, made many difficult decisions that challenged their current understanding of their customers. That’s no easy task. We work so hard on our brands that we assume we know our customers. Perhaps we’ve already tested heavily with our customers. To publicly go against the wisdom we think we have already gained about our customers in a campaign (particularly one that’s expected to generate revenue) goes against every bone in our marketing bodies. You might sometimes get a loss, but you will always get a greater understanding of the customer (if you experiment correctly). And in the long run, that is how you achieve sustainable business results. “Marketers need to leave their ego at the door and look at their messaging with a different eye. Our instincts are not always the consumers’,” Bruce suggested. While none of the treatments outperformed the control, we were also holding a copywriting contest, as I mentioned previously. The winner of the contest is the writer of the best performing treatment, even if it didn’t beat the control. After all, these intrepid copywriters were creating a treatment against a control created by experienced marketers with a deep inside knowledge of their brand. When comparing the treatments against each other, Treatment 3 (quality of research) outperformed all the other treatments with the largest increase in clickthrough compared to Treatment 4 (24.1% increase at 99% LoC). So congratulations to the writer of treatment 3: Ahnna Pildysh, product marketing freelancer, Malaspina Labs. Ahnna won a ticket to MarketingSherpa Summit 2016 and a stay at the Bellagio Resort. “Since Treatment 3 themed around ‘quality of research’ was second to the control in terms of clickthroughs and donations, I learned that this theme resonates and is one we haven’t emphasized as much in past communications and perhaps could emphasize more in our future messages, along with product testing,” Dawn said. “This contest piqued my interest simply because it gave me an opportunity to test my ability to craft a value prop. I’m a big believer that everything should be tested to gain useful learnings and continuously iterate,” Ahna said. Congratulations again to Ahna, and thanks to all of the marketers and copywriters who took the time to share their wisdom and provide insights Consumer Reports can use to better serve donors and consumers.